Strikeforce light heavyweight champion Gegard Mousasi informed Sherdog.com that he has amicably parted ways with his M-1 Global management team and that the two sides will no longer do business together. As we are all well aware, M-1 Global also reps the world’s baddest heavyweight, Fedor Emelianenko, who has publicly stated in the past that he owns a stake in the organization. Apy Echteld, an M-1 Global representative, told the website that the move was purely a business decision and Emelianenko would like to train with Mousasi again in the future. Mousasi has already formulated a new management team, however would only disclose that a person “close” to him would be handling his affairs from here on out. Under M-1 Gobal’s tutelage, Mousasi blossomed into one of MMA’s best unknown superstars en route to capturing a pair of major titles in two different weight classes. 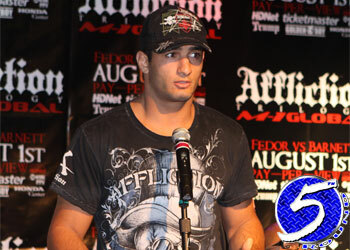 After claiming Dream’s Middleweight Grand Prix in 2008, Mousasi voluntarily left the strap behind to focus on the 205-pound division. The striker jumped State-side and quickly claimed Strikeforce’s light heavyweight title with a 60-second shellacking of then-champ Renato “Babalu” Sobral in August. The 24-year-old holds a dominant 28-2-1 professional record and hasn’t lost a fight in three-and-a-half years. According to the trusty rumor mill, Strikeforce is considering having Mousasi make his first title defense against Muhammed “King Mo” Lawal on their second CBS broadcast on April 24th.